There is a flip side to what we say about Jason Heyward right now – i.e., his results are incredible and he looks fantastic, but lots of guys can have a couple weeks where they look unstoppable, and it just stands out to us more than usual when it happens in the first two weeks of the season. That flip side is what we’ve gotta say about Albert Almora right now: his results are abysmal and he looks terrible, but lots of guys can have a couple weeks where they look totally lost, and it just stands out to us more than usual when it happens in the first two weeks of the season. I don’t think it’s fair to believe one of those things and not the other, especially when the guys we’re talking about had roughly equal chances coming into the season (on paper) at putting up a league average or better offensive season. For example, ZiPS projected .260/.331/.389 (89 OPS+) for Heyward before the season, and projected .271/.308/.383 (81) for Almora. Heyward has the much better and longer track record, but he also had the more recent deep decline. I think if everyone is being honest with themselves, it was pretty hard to have a VERY CERTAIN AND STRONG feeling that one of the two would dramatically outperform the other this season. I didn’t. Heck, I very well might’ve pegged Almora to finally take a step forward, and I’d be lying if I said I saw too many more better-than-average offensive seasons in Heyward’s approaching-30 career. Of course, that could still happen – such is the nature of two-week samples! – but we’ve gotta mention some troubling things about Almora if we are also going to note some encouraging things about Heyward. The numbers for Almora so far are a small sample (just 39 plate appearances), but they are as grim as it gets, despite facing lefties nearly half of the time: .222/.263/.222, 32 wRC+, .000 ISO, 5.1% BB, 23.1% K, and the worst one of all, a 74.1% groundball rate. If a pitcher had a 74.1% groundball rate, he would be crazy, one-of-a-kind Hall of Famer. Whatever the reverse hitting equivalent of that is, Almora has been it for these first two weeks of 2019. OK, so it’s a lot of ground balls, but it’s so few balls in play, right? I mean, how bad could his quality of contact be among guys with, say, 25 batted balls so far this year? Almora’s average exit velocity is just 85.3 mph, per Statcast, good for 162nd in baseball (out of 191). He has zero barrels this year, which isn’t really a surprise, since a barrel is basically the ideal combination of exit velocity and launch angle to produce maximum damage, and Almora’s launch angle is …. worst in baseball at NEGATIVE 1.8 degrees. There are only three players below positive 2 degrees! 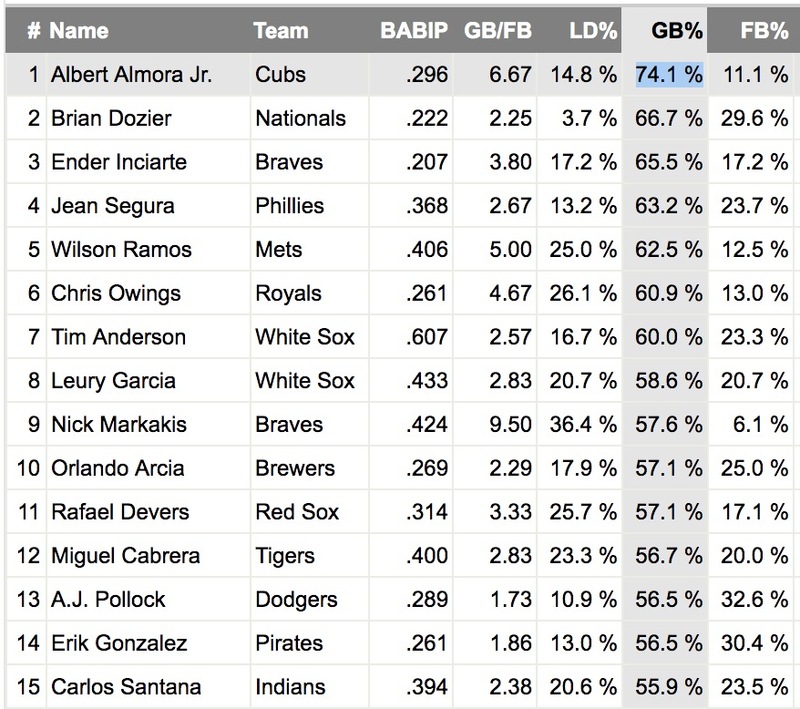 So, yes, Almora is truly on an island of terrible performance right now. HOWEVA, this isn’t just about dumping on Almora, who has plenty of latent talent, and whose bat need be not much more than average for him to offer plenty of starting-caliber value thanks to the glove. Instead, as I thought about Heyward’s hot start meaning he should probably see even more lefties, and thought about the impact that could have on the outfield rotation, I came back to that whole “production versus talent” stuff from the offseason. 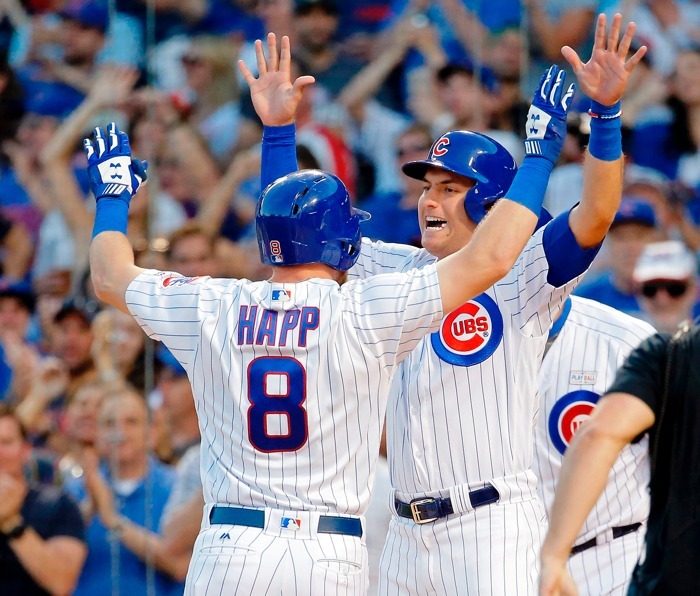 Ian Happ’s demotion to Iowa to open the season sort of became the flag for the concept, but it’s not solely about demoting a guy so the Cubs can try to unlock some more production in the long-term (while opening up starts for production at the big league level in the meantime). It can also mean being realistic about what a guy can offer you in a competitive year, as the Cubs have already been annually with respect to Almora. The glove is so good that it’s hard not to have him on the big league roster right now. But, even if that talent is in there for him to finally step forward and be a slightly-above-average bat, the Cubs need production right now, and I’m not convinced he’s going to give it to them without fundamental improvements in his quality of contact. How to best put him in position to make those improvements without crushing the Cubs at the plate in the interim remains a challenging question. Let’s not forget that Almora’s positive first half last year was almost entirely BABIP-fueled, and nothing in the underlying quality of contact suggested it was real. And, then, what do you know, his production fell way off in the second half: .232/.267/.280, 47 wRC+. So, in reality, we’re not just talking about two bad weeks. Like with Carl Edwards Jr., it’s not out of the question that something has been very wrong for much longer than just this start of the season, and the Cubs’ approach to Almora is probably going to contemplate that. So then I do circle back to wondering whether Almora benefits enough from time spent back at Iowa, working on his quality of contact, that it justifies taking his glove out of the big league mix right now (it would have been nice to have another big bat outfielder in the mix to make this decision much easier, but we’ll just leave that frustrating storyline in the offseason). Keep in mind, Almora spent only a half a season at AAA, came to the big leagues at 21, and then had to try to develop for the next two years as a part-time player on a competitive team. Tall ask. To be quite clear, I’m *not* saying Almora should definitely be sent to AAA Iowa right now, just because that’s what happened to Happ and Edwards, or because Almora has had a brutal start paired with a brutal second half last year. I’m simply saying there’s another opportunity here to figure out the right talent versus production calculus for a guy like Almora, who provides stellar defense in center field, and allows Jason Heyward to continue doing the same in right field. But if Heyward is going to start taking more and more starts against lefties, and the Cubs want guys like Ben Zobrist and David Bote and Mark Zagunis and Daniel Descalso and Kyle Schwarber in there more often against lefties, too? This is a conversation that should be underway.